When we're on patrol, Baykeeper monitors for boats that pollute the Bay. We recently spotted a boat at a holding facility that was removed from the Bay because it was illegally anchored in San Francisco's Aquatic Cove for several months earlier this year. After receiving reports that the boater had been dumping raw sewage into the Bay, Baykeeper advocated for the boat's removal, and authorities impounded the vessel. Now it is no longer polluting the Bay. One of the perks of going out on boat patrol is seeing the Bay's beautiful wildlife. 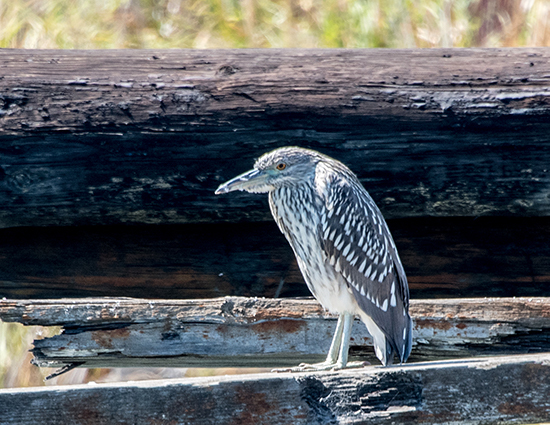 Below is a picture taken from aboard the Baykeeper boat of a night heron near the San Francisco shore, captured by our volunteer photographer, Robb Most.